The Panch Kedar trek includes all the five shrines associated with the Hindu legends. All of them are situated in the Kedar Valley. At Kedarnath, situated at the head of the Mandakini River, the Linga is a natural rock that resembles the hump of a bull. Madhmaheshwar, situated at the base of Chaukhamba Peak is at an altitude of 3500 m. Here the Linga is worshipped in the form of a navel. Tungnath, where tha arm of Shiva appeared is the highest temple in Garhwal is situated at an altitude of 3810 m. 500 m above the temple at Tungnath is Chandrashila. The panoramic view of the Himalayas is breathtaking. Rudranath is where the face of Shiva is said to have appeared. 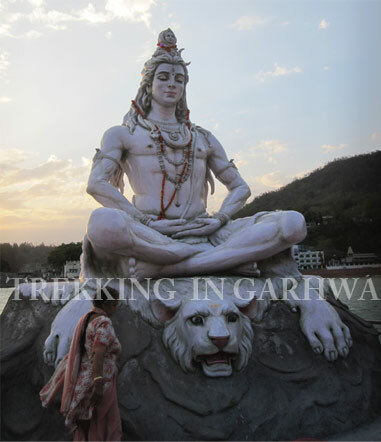 Here there is a natural rock temple in which the Shiva Mukha is worshipped. To reach Rudranath, one has to trek through alpine meadows and dense forests. Kalpeshwar is situated in the beautiful valley of Urgam. There is a cave temple here and Shiva is worshipped in his matted hair form. .
On arrival at airport met our representative and transfer to hotel for overnight stay. Post breakfast drive to Rishikesh. Lunch en route. On arrival at Rishikesh check into hotel. 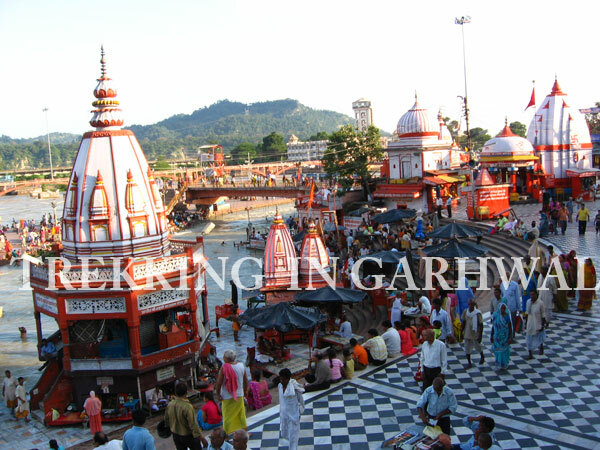 In the evening visit the local Temples, Laxman Jhoola and Triveni Ghat for Arti ceremony, a spectacular ceremony of sounds, lights and chanting! Dinner and overnight stay at hotel. After breakfast drive to Pipalkoti via Devprayag, Rudraprayag, Karanprayag, Nandprayag, all very revered river confluences, Devprayag amongst them occupying pride of place, as this is where the river Ganga is known by this name! This little town built on a sheer rock face has an ancient temple dominating its outline, and was visited by the great Hindu philosopher Adi Shankaracharya in 300CE. On arrival check in at the hotel. Dinner and overnight stay at the hotel. After breakfast drive 15 kms to reach Helang. From this point we one starts the trek up to Urgam Village. On crossing the Alaknanda River via Road Bridge, the trek passes through a dense forest, cascading water falls while tralelling along the KalpGanga. Urgam Valley is famous for its apple orchards, terraced fields and potato plantations. Evening free to explore the fascinating Urgam Valley. Dinner and overnight stay in tents. An early morning breakfast marks the walk up to the first Kedar (one of Panch Kedar). For this trek one has to leave with packed lunch packets. The locks (hair) of lord Shiva are worshiped in this temple. From here one will have the striking views of valley with terraced fields and lush green forests. Post Darshan, one is required to return to Urgam. Dinner and overnight stay in tents. After an early breakfast one is required to trek up to Kalgot Village through a dense forest, followed by lush green meadows. This is a tough day owing to the long distance trevelled. Evening arrival at Kalgot village. Meet the locals, and get to know their culture. Dinner and overnight stay in tents. Trek up to the temple of Sri Rudranath, after breakfast- another form of lord Shiva. In this temple the face of Shiva is worshiped. From here we can see a splendid view of Hathi Parvat, Nanda Devi, Nanda Ghunti, Trishuli and other group of peaks. One can also visit the Suryakund, Chandrakund, Tarakund which is located near the temple. Dinner and overnight stay in tents. Trek down to Sagar Village after breakfast, through dense forests and meadows. Upon arrival at Sagar drive to Mandal. Mandal is also known Cherapunji of Garhwal, as it is well known for its heavy downpours especially during monsoons! Dinner and overnight stay in tents. Drive to Chopta after breakfast. Chopta – known as the Switzerland of Grrhwal is situated at an altitude of 2900 m above sea level. The location provides a panoramic view of the Himalayas and the surrounding areas. Upon arrival at the high altitude grasslands of Chopta, trek to Tungnath (the third Kedar) with packed lunch. Tungnath is situated at an altitude of 3680 mts above mean sea level , and known as the the highest Shiva Temple in India. The trek covers three kms following a continuous upward incline. En route one will find lush green meadows and can see the entire range of snow clapped Himalayan ranges. Upon arrival at Tungnath Temple visit the ancient temple. After relaxation one can trek to Chandrashila peak 1 km ahead. Dinner and overnight stay in Tungnath. In the morning trek back to Chopta after breakfast, and from here drive to Jagasu (45 kms/2 hrs). Upon arrival at Jagasu, trek up to Gaundhar. 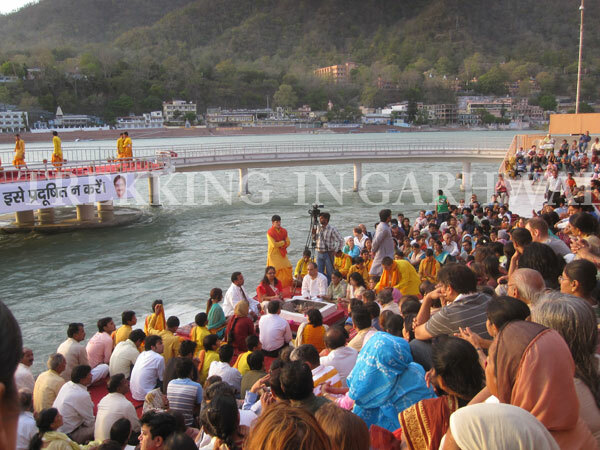 The confluence of Madmaheshwar Ganga and Makandya Ganga is the final place that one encounters before one reaches Madmaheshwar. Dinner and overnight stay in tents. After an early breakfast, it is recommended to start the (18 kms/5-6 hrs) trek up to Madhya Maheshwar (the forth Lord Shiva temple of Panch Kedar). It is believed that the navel mid part of the body reappeared at this shrine after disappearing at Kedarnath. On arrival set camp here. From here one can see the magnificent view of Chaukhamba, Kedarnath and the Neelkanth peaks. Dinner and overnight stay in tents. After an early breakfast trek 12 km to Jagasu and drive to Guptkashi (30 kms). Dinner and overnight stay at Hotel. Post breakfast, drive to Gaurikund -the place where Gauri – also known as Parvati committed Herself to penance involving many ascetic and yogic practices to win over Shiva's affections. Local tradition claims that Gauri Kund is the spot where Gauri lived while carrying out these practices, and from here 14 km trek up to Sri Kedarnath, one of the twelve Jyotirlingas of Lord Shiva. The trek is passes through beautiful surroundings and offers astounding views of the river valley on the right hand side!. On arrival check in at guest house. Evening explore the surroundings. Dinner and overnight stay in Guest house. Post breakfast drive to Haridwar via Devprayag (Confluence of Alaknanda and Bhagirathi. From here the Holy River Ganges starts is journey to Rishikesh and beyond). From Haridwar board the A/C train for Delhi. Arrival at Delhi by night. Upon arrival at Delhi transfer to hotel for overnight stay. Morning after breakfast full day sightseeing tour of Old and New Delhi. Evening transfer to airport to catch a flight for onward destination.